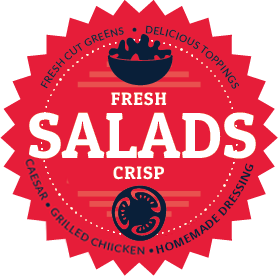 Salad Dressing Options: Ranch, Honey Mustard, Bleu Cheese, Italian, Raspberry Walnut Vinaigette, Thousand Island, Balsamic Vinaigrette. Lightly marinated grilled chicken breast served over crisp romaine lettuce tossed with Caesar dressing and parmesan cheese. Fresh mixed greens topped with diced tomatoes, eggs and bacon. Served with your dressing of choice. Romaine tossed in our Caesar dressing, topped with Parmesan cheese and croutons. A bowl of chili and your choice of a garden or Caesar salad. A taste of Mexico in our freshly mixed greens, black bean salsa, fresh corn and pico de gallo all tossed in our homemade balsamic dressing. Topped with chicken, Cheddar Jack cheese, chipotle ranch and fried tortilla strips served with a cheese quesadilla. Grilled chicken breast nestled on top of our mixed greens with shredded Monterey Jack and cheddar cheeses, bacon, croutons, fresh diced tomatoes and topped with almonds.